Designing with Inventor® 11 is an introductory program for students using Inventor® 11 software. Students follow step-by-step instructions to create three-dimensional models. Students do not need previous experience working with Inventor® software. Four-color format allows students to see the visual clues provided in the Inventor® 11 software. Allows students to "jump right in" and create complex three-dimensional models in record time using easy-to-follow, step-by-step instructions. New four-color format allows students to see the visual clues provided in the Inventor® 11 software. 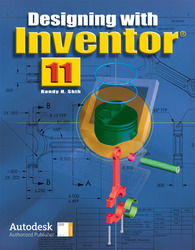 New Inventor® Visualized Student CD-ROM allows students to learn and practice on their own.